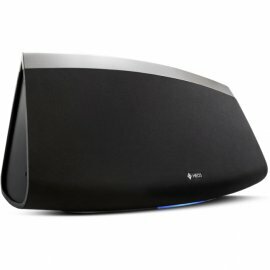 The HEOS 7 HS2 is a wireless speaker that has being updated to feature high resolution audio support, with its now Bluetooth fully integrated into the system, the previous rear USB port which was lost due to the Bluetooth USB, is now free to be used by other devices. This product is ideal for large rooms, as it produces the demand of the best and biggest sounds for the acoustics. It can play music on the cloud and any music stored on your portable device or USB sources. By producing acoustic sounds that are optimised to give the most precise sounds like you were hearing them directly played. The HEOS 7 features five custom drivers, five Class D amplifiers and two passive radiators which are controlled to give the best in digital signal processing. With the HEOS app you have full multi-room control over your audio, it can be installed on numerous devices. Using your device you can control the music which is being played in different rooms or synchronize them so that they play the same song at the same time.